As stories and legends get passed on, as with rumors and gossip, facts are sometimes changed and altered depending upon the lineage or simply the memory of the story teller. As time goes on many of these stories are taken as fact, completely true without a second thought. The heroes are supermen with the ability to defend themselves without even ruffling their hair. 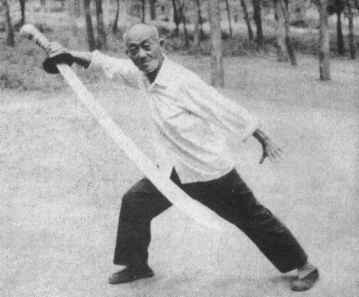 One story Pa Kua practitioners have grow up hearing was the famed fight between Tung Hai-Chuan and Kuo Yun-Shen. This story says they fought for three days, the third day Tung took the offensive and humbled Kuo. Kuo was nicknamed "Divine Crushing Hand" since this was his trademark, having the ability to kill with one punch. After this fight they supposedly became friends and vowed that a student of one should be a student of the other. In the research of Zhang Jie the story is a little different. Kuo was on his way to challenge Tung and stopped to visit Ch'eng T'ing-Hua, an acquaintance he knew who was a student of Tung's. Ch'eng advised Kuo not to challenge Tung since Tung had never been defeated. Kuo also had never been defeated up to that time and it would damage his reputation if he lost. Taking this as an insult, Kuo thought Ch'eng should get a sample of his skill and attacked with his famous "Crushing Fist." Ch'eng easily evaded the attack and moved inside his house and sat down. The ease and quickness in which Ch'eng could evade his attack impressed Kuo. Kuo hadn't seen anyone move as fluidly and evasively as Ch'eng. He followed Ch'eng into the house to find out more about this art. Ch'eng told Kuo that Tung's ability was far superior to his own so it wasn't a good idea to seek a match. They sat down and compared theory and principles of their mutual arts. This evolved into a friendship and a sharing of the two arts. From this sharing Ch'eng evolved the Wu Hsing San Ts'ai San P'an (Five Elements, Three Powers, Three Levels) Pa Kua Form. This form begins as a 24 movement set divided into three sections -in fact, most of the Beijing Pa Kua forms are divided this way. The first level is basic and simple, the next a bit more difficult, and the last more complicated. The first section begins with the Five Elements of Hsing-I with a Pa Kua "flavor." The Elements are done on the circle along with moves from some of the animal forms. The second section has more Pa Kua palm emphasis with the Hsing-I "flavor." The last section combines the two and adds more turning and waist movements. This form works on the hard and soft, issuing and storing of ching from hand strikes to body strikes, exploring all angles and directions. All the movements can be repeated as individual sets on the circle in interesting combinations as well as having all 24 movements linked continuously into a good workout routine. As with all styles and forms there are various additional movements within the set taught to favored students making the linking form longer than 24 movements. 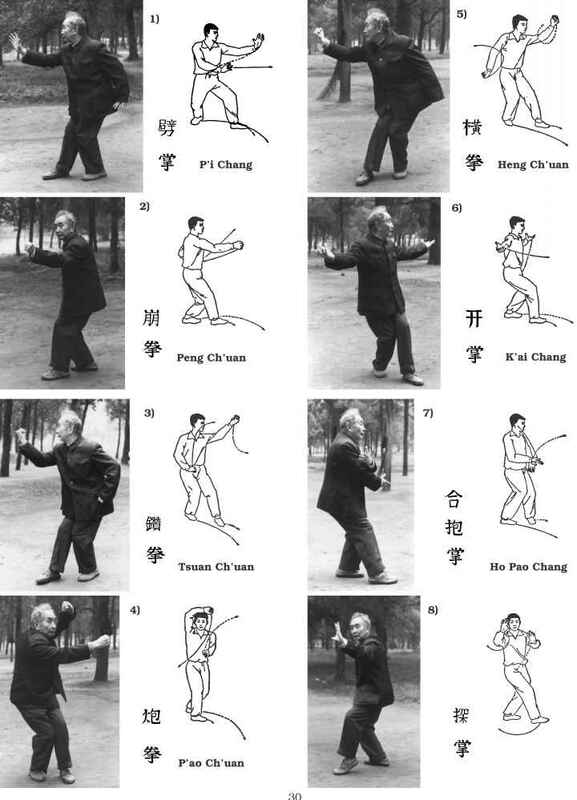 Even the movements from Hsing-I have a different feel, a rounded more flexible feel to them that the standard Five Elements of Hsing-I Ch'uan. Those not familiar with Hsing-I think standard Hsing-I is just linear, which isn't quite true. Hsing-I also contains a twining, internal spiraling to store and release the ching. The Pa Kua Hsing-I adds a rounded feel and flexible feeling to all the movements with the spinning, turning footwork of Pa Kua Chang. Once all the basic 24 movements are learned correctly and the student does them consistently correct they are done walking five connected circles representing the Five Elements. One of the patterns represents the destructive cycle of the five Elements and the second the creative cycle, these forms are 40 movements each and together become 80 changes. Practicing the various destructive or creative cycle gives the student a study period on the inner connections and relationship of the various five elements and uses as they practice the movements. These linking forms are equally a workout and study for the mind and spirit as well as the body. The mind learns to deal with the complex patterns, directions and linking and transitions of the 24 movements in the five circles. The sections are done in the Yin direction of a certain element flowing into the Yang direction of the next then the Yin direction of the next and so on weaving back and forth. In addition to this, you also interconnect the various Kua's from one circle to the other. 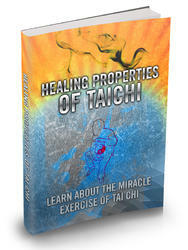 Such as moving from the Chien Kua of the earth circle to the Kun Kua of the Water circle. This has a similar feel of weaving back and forth as circling the posts, "Bird Entering the Forest." At the end of the linking form the practice ends with the Pa Kua Je Kung. The center (earth) circle of the Eight Backfists. These are not the same as the 24 movement form: 8 fists, 8 elbows, 8 palms of Beijing Pa Kua. Though all the Pa Kua forms eventually are done quickly the Wu Hsing Pa Kua continually moves from quiet to bursts of attacks. It adds a nice dimension to continuous flow and turning of Pa Kua Chang. The first section of the Wu Hsing Form is detailed on the following page. The line drawings are taken from Liu Hsing-Han's book Yu Shen Pa Kua Lien Huan Chang. The photographs were taken by Dan Miller in Beijing, October 1992.